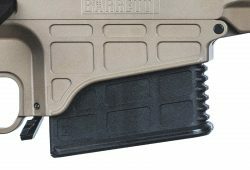 Christiania, TN: Barrett, in conjunction with Elite Defense, is proud to announce that Oakland County Sheriff’s Office (Pontiac, Michigan) has selected the Barrett MRAD as their primary precision rifle platform for use by the SWAT Team Sniper Unit. Oakland County Sheriff’s Office is one of the nation’s largest Sheriff’s Offices, overseeing 1,400 employees and managing an annual budget of $156 million dollars. Located just north of metropolitan Detroit, the Sheriff’s office is headquartered in Pontiac, Michigan and led by Sheriff Michael J. Bouchard. The OCSO SWAT Team consist of highly skilled and trained group of deputies selected from personnel throughout the Sheriff’s Office. 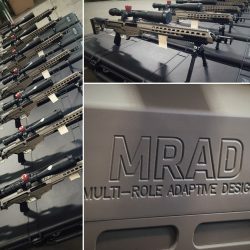 The Sheriff’s Office selected the MRAD after a competitive test and evaluation phase conducted by the sniper unit of the SWAT Team. The selection process included not only an evaluation of accuracy and performance, but also the modularity of the platform and the long-term serviceability was taken into consideration. The MRAD is ideally suited for the role of precision marksmanship that the law enforcement sniper finds themselves in today. The MRAD was designed with both precision and modularity in mind. It’s monolithic upper receiver is machined from 7000-series aluminum, that includes a full-length M1913 Picatinny top rail which allows for the addition of clip on devices in conjunction to day optics. 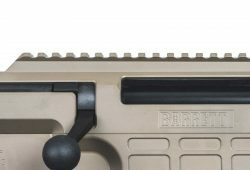 It also features a user-changeable barrel system allowing the MRAD to be easily and quickly converted to different calibers by simply loosening two bolts using a Torx wrench and changing out the match grade barrels. 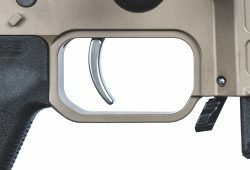 The lower receiver contains a fully adjustable match-grade trigger module, a folding stock that includes tool-less length of pull and cheek piece adjustment allowing for ease of transport and a detachable box magazine. Barrett is confident in the performance of the MRAD and knows it will be a valuable asset to the Oakland County Sheriff’s Office, no matter the scenario they may encounter while carrying out their role to protect and serve. The mission is straightforward: help the good guys get the things they need to get the job done. Whether it’s procurement needs, including munitions or weapon systems, custom development projects, or armor solutions, Elite Defense is a company dedicated to getting the good guys what they need, when they need it, for the best value. The members of Elite’s staff bring over 35 years of combined product and business development experience to the small arms marketplace here in the United States and abroad. This, combined with the strength of our relationships within the defense and public safety marketplace, direct operator and industry feedback on products and concepts, and countless strategic alliances within the industry, allows Elite to bring the most industry know-how to the table when the need arises.